"Here's a tangy citrus delight. It turns out a light orange color loaf with a delicate orange flavor." Place ingredients into the pan of the bread machine in the order suggested by the manufacturer. Select the White Bread or Basic cycle, and Start. My wife and kids think this is a great bread. We really enjoy the flavor. I experimented and substituted honey for the sugar. It was great! The conversion for the yeast is .25 oz. = 2-1/4 tsp. This bread did not have much flavor. I love to make this bread in the evening and use it the next day for french toast. Try serving it toasted and topped with honey or apple butter. It's wonderful! Delicious! Makes the whole house smell like fresh oranges. The bread has a delicious flavor. Delicious but not much on orange flavor. 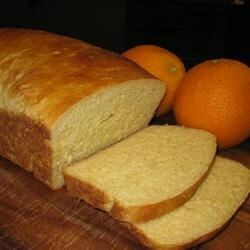 This recipe produces a wonderful loaf of Orange Bread. I recommend it highly.